I am pleased to announce the formal establishment of the Oral Health Services Research Core in the Philips Institute for Oral Health Research and naming of its first director, Dr. Tegwyn Brickhouse. The core’s mission is to conduct oral health services research and partner in strategic initiatives with the university, health system, and community to improve and integrate oral health into overall health and healthcare. This is a critical area of research expertise that our school must develop to position ourselves for research and education in oral health services and public health dentistry. Hardly a week goes by that I am not contacted with inquiries on access to care, dental workforce, dental graduates career choices, oral disease statistics, and dental insurance. I am sure you have seen the headlines on the oral health crisis in America, doubling of hospital emergency department visits for dental problems, and declining dentist migration to rural and underserved areas. Adults appear to be seeking dental care at lower rates and only 50% of children with public support for dental care have seen a dentist in the past year. The rising cost of dental education and the national average educational debt of $250,000 of graduating dental students have negatively impacted the distribution of dentists and are fueling the development of alternative providers and practice models. The Commission on Dental Accreditation recently announced it is implementing accreditation of Dental Therapy Programs. The 2016 Virginia General Assembly adopted a bill to expand remote supervision of dental hygienist beyond the Virginia Department Health and into certain venues to increase access to preventive care for underserved populations. The effectiveness of our current and future models of care delivery require ongoing study and assessment. Over the past two years, Dr. Tegwyn Brickhouse and I have conducted meetings and conference calls with researchers, academic leaders, leaders in the insurance industry, leaders in government agencies, and political people to understand the need and to create a vision for this research core. There is so much that is needed to be learned regarding dental public health and dental services utilization, particularly in Virginia. Additional exploratory projects are underway with the Chesterfield County Schools Systems and the VCU Health System’s Community Memorial Hospital in South Hill, VA to bring needed dental services to underserved individuals. With VCU School of Dentistry the only dental school in Virginia, we must become experts in oral health services and disparities research. Dr. Brickhouse is being appointed full-time to lead the development of this initiative effective July 1, 2016 as a member of the Department of Pediatric Dentistry. Dr. Brickhouse will continue to serve as the Chair of the Department of Pediatric Dentistry while we conduct a national search for a new department chair. Under her leadership this organization secured over $1M in grant funding, contracts, and donations. 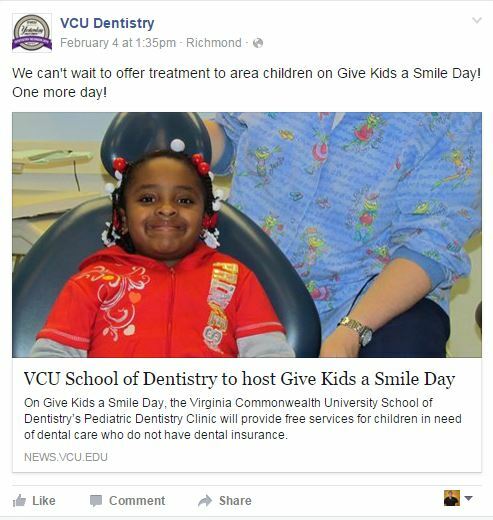 Established a relationship with Children’s Hospital of Richmond and VCU’s pediatric dental program that led to integration of faculty support and resident patient care rotations at the Brook Road hospital practice. Created the Pediatric Dentistry Board of Advisors and led the fund raising effort which resulted in the establishment of the Farrington Mourino Distinguished Professorship. Serves as a member of the Virginia Department of Medical Assistance Services (Medicaid) Dental Advisory Committee and established a data sharing agreement with DMAS to examine dental utilization in Virginia’s Medicaid program. VCU Health’s representative to the Children’s Health Insurance Program Advisory Committee of Virginia (CHIPAC). On-going collaborations with VDH Division of Dental Health related to their needs assessments, sealant programs, and courses for training dentists to treat patients with disabilities. American Academy of Pediatric Dentistry’s Jerome B. Miller For the Kids Award awarded by Healthy Smiles Healthy Children Foundation. The Professional Achievement Award for Women in Dentistry, WISDM Virginia Commonwealth University. Served on the scientific advisory board of the National Children’s Oral Health Foundation, awarded Affiliate Site of the Year and received grant funded for five years to support community outreach and engagement. Analysis of health care claims data to understand the impact of healthcare reform and innovations in healthcare delivery, including a focus on solutions to dental workforce and oral health disparities among vulnerable, rural, and under-served populations. Explore additional educational programs and curriculum for students in the area of dental public health. Broadening access to education for students of diverse backgrounds. Creating an inclusive environment for diverse faculty. Being a catalyst for connections within the university community and with the community at large. Fostering innovative research and solutions to societal problems across boundaries. Partner with local and national organizations (e.g. ADA, VDA, Virginia Oral Health Coalition, Virginia Health Care Foundation) to connect national data with state-level needs and initiatives. Engagement in the broader university and health system to increase capacity for dental care to children and individuals in rural and underserved populations (e.g. South Hill). The Director will lead the development of proposals to seek additional extramural funding to support the core’s mission. Last Friday a large host of students, residents, staff and faculty members contributed to our annual Give Kids A Smile event at VCU School of Dentistry. Under the leadership of Dr. Liz Berry in the Department of Pediatric Dentistry, preliminary data indicated over 200 children benefited from this event. With the increased volume of patients, the entire Douglas and Pediatric Dentistry Clinics were full and busy way past 5 pm. Faculty from the Department of General Practice jumped in with our entire pediatric dentistry faculty and residents to help these children go home and on the road to better oral health. Students from all dental and dental hygiene classes volunteered in mass. They even let me help out! There are too many people to mention by name but you all know who you were and I appreciate your service, dedication, and hard work. If you were there record a “Like” or comment on SOD Facebook. 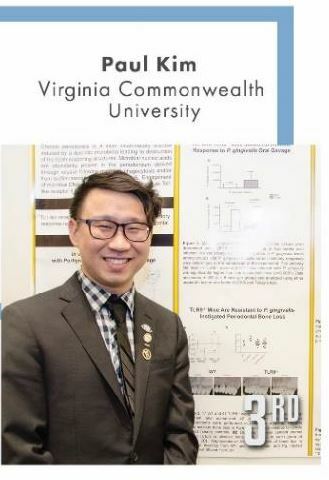 Paul Dado Kim (D 2018) participated in the ADA/DENTSPLY Student Clinician Research Program at the 2015 American Dental Association (ADA) Annual Session which was held in Washington DC last weekend and won the 3rd place award in the basic science category. Kim’s study titled “TLR9-mediated inflammation triggers alveolar bone loss in experimental murine periodontitis” investigated the involvement of an innate immune sensor, TLR9, in the progression of periodontal disease utilizing a transgenic mouse model. The results of the study showed that mice lacking TLR9 was protected against alveolar bone loss thereby identifying a possible new therapeutic target for periodontitis. “I am really happy to be part of this project. Our findings will hopefully be translated to the clinics to improve treatment outcomes,” said Kim. A total of 61 students from each dental school across the country competed in the 56th ADA/DENTSPLY Student Clinician Research Program. “It was a great honor to represent VCU and came back home with an award among so many outstanding projects from all the different institutions,” said Kim. “I also would like to thank my mentor, Dr. Esra Sahingur, and the entire research team for giving me the opportunity to work in this project and for their continuous support”. The results of this award winning study was published in the journal Infection and Immunity last May; Kim, P. D., Xia-Juan, X., Crump, K. E., Abe, T., Hajishengallis, G. & Sahingur, S. E. (2015) Toll-Like Receptor 9-mediated inflammation triggers alveolar bone loss in experimental murine periodontitis. Infection and Immunity 2015; 83:2992-3002. Congratulations to Paul Dado Kim! Dr. Perry Jones has been serving as our Director Continuing Education since 2011. At the end of September, Dr. Jones will be stepping down as director but will continue as a part-time faculty member and continue to provide instruction in the continuing education courses he has been offering. Under his leadership, much positive change has taken place including reorganizing the office as a branch of Dentistry@VCU, implementing a state-of-the-art management system for course registration and record keeping, and lowering the operating cost of the office. Under Dr. Jones watch, and with the help of Dr. Laurie Carter, our ADA CERP accreditation was successfully renewed. I am very thankful for his service and his willingness to step into this role at a time when many other changes were taking place in the school. With Dr. Jones stepping down, the Office of Continuing Education will be reorganized with Ms. Pamela Flynn reporting to Ms. Kim Jacobs in the Office of the Executive Associate Dean, Ms. Rebecca Pousson. Ms. Flynn has relocated to Wood first floor, room 102. As required for CERP accreditation, the program has an advisory committee which we plan to expand. The advisory committee’s role is to provide guidance on priorities for course offerings. If you see Dr. Jones, please thank him for his service to our CE program as well as to our school. I am pleased to announce the upcoming programs for Friday August 28th. Dr. Janina Lewis, Director of Faculty Advancement, and I will conduct a session for new faculty members on the faculty promotion and tenure system and process in the School of Dentistry. This will take place in Brown Conference Room (Perkinson 3114) from 2:20 to 3:30 PM. A special announcement was sent to new faculty members previously but if you missed it please let Dr. Lewis know you would like to attend. Also on Friday August 28th, we are fortunate to have Dr. Roberta Pileggi, Associate Professor, Chair, and Director of Graduate Endodontics & Associate Dean & Director for the School of Advanced Dental Sciences at the University of Florida College of Dentistry (UFCD) speaking to our faculty. Dr. Pileggi will be speaking in Perkinson 3121 on two topics. From 2:20 to 3:30 she will be discussing CODA Advanced Education Preparation at the UFCD. Following this session 3:40 PM, she will be speaking on Dental Trauma Research, also in Perkinson 3121. Both sessions are open to all faculty members. You can learn more about Dr. Pileggi at http://dental.ufl.edu/about/people/faculty/endodontics/roberta-pileggi/. I personally enjoyed and learned much from program provided in July by the Behavioral Learning Team (BLT) from the School of Allied Health Professions last month. The BLT faculty of Amy Armstrong, Laurie Cathers and Chris Wagner covered the array of topics our students will be learning in the new behavior sciences curriculum starting this semester. As a reminder, under our new school schedule, Faculty Development programs are scheduled for the fourth Friday PMs of each month (except November and December for obvious reasons) and also the second Friday PMs in March, April and May. Due to the international bike race, there will not be a program in September this year. Looking ahead to October 23rd, the program will include ECHO 360 use, Exam Soft and setting up Blackboard and Banner Grade entry. I am pleased to announce the appointment of Dr. Clara Spatafore as chair of the Department Endodontics. She has been serving as the interim department chair since October 2014. Dr. Spatafore attended West Virginia University where she received her undergraduate degree in Medical Technology. Dr. Spatafore then earned her D.D.S., M.S. and Certificate in Endodontics from West Virginia University School of Dentistry. A member of the American Association of Endodontics (AAE) since 1987, she has held a variety of leadership roles with the organization’s Board, including president, president-elect, vice president and secretary of its Executive Committee as well as a director. Dr. Spatafore, a Diplomate of the American Board of Endodontics, has been a member of several AAE committees, and she serves on the Journal of Endodontics’ Scientific Review Board. Dr. Spatafore lectures nationally and internationally in all facets of endodontics. During her short time as interim chair she has accomplished much including the development of a strategic plan for the department and obtaining funding from the AAE Endowed Faculty Matching Grant program to assist in completing the fund raising for the Neil Dodds Professsorship. Congratulations Dr. Spatafore! I am delighted to announce the Dr. Clara Spatafore has joined our faculty and will serve as the interim chair of the Department Endodontics. Dr. Spatafore was born in Clarksburg, WV, attended West Virginia University where she received her undergraduate degree in Medical Technology. Dr. Spatafore then earned her D.D.S., M.S. and Certificate in Endodontics from West Virginia University School of Dentistry. Following completion of her training, she served as an endodontist in the United States Navy. Currently,she is a part-time private practitioner in Sewickley, Pennsylvania, and also serves as an assistant professor of endodontics at Drexel University’s School of Medicine. Dr. Spatafore also serves as a clinical instructor at the WVU School of Dentistry. A member of the American Association of Endodontics (AAE) since 1987, she has held a variety of leadership roles with the organization’s Board, including president, president-elect, vice president and secretary of its Executive Committee as well as a director. Dr. Spatafore, a Diplomate of the American Board of Endodontics, has been a member of several AAE committees, and she serves on the Journal of Endodontics’ Scientific Review Board. Dr. Spatafore is a member of the American Dental Association, and currently, the Pennsylvania and Western Pennsylvania Dental Associations. She also holds fellowship in the American College of Dentists. Dr. Spatafore lectures nationally and internationally in all facets of endodontics. Dr. Spatafore brings a wealth of knowledge, experience, and networking to the VCU School of Dentistry. Please welcome Dr. Spatafore to our faculty! Every year prior to graduation, senior students are asked to provide feedback on their overall educational experience that is used to improve the dental and dental hygiene programs. Over the past several years, graduating dental students expressed that they wished more opportunities were available to tailor their educational experiences to their own areas of need and/or interest. 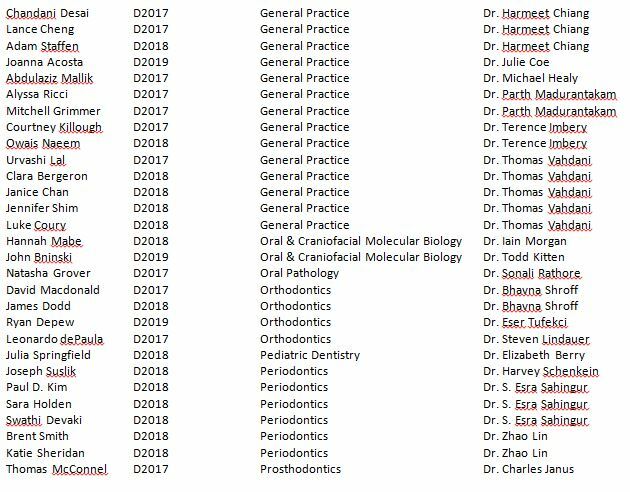 As a direct result, the faculty of School of Dentistry has designed several senior “selectives” in a program that was implemented for the first time this fall. For now, the clinical, patient-based selectives are open to senior dental students only. “We are open to the possibility of offering appropriately designed selective opportunities to other students in the future,” said Baines. And the hope is to expand current selective offerings to include a broader range of topics based on student feedback and faculty interest. The student-driven initiative has proven beneficial to the clinical faculty and residents as well. They enjoy working in a one-on-one setting with enthusiastic and highly motivated students. A student’s primary responsibility still is to his or her core educational program, which includes a patient panel and service learning rotations. Students work carefully to schedule their selective experiences so as not to disrupt their primary clinical experiences. The response from the current D4 class was outstanding. The first round of applications outnumbered the selective spots available at the moment. Every selective was filled to capacity for the fall semester. Applications for spring selectives will open soon. Senior dental students in good academic standing may apply.